A console may never have hardware that can equal a PC, but those devices sure as hell can utilise what they’ve been given in a far more efficient manner. Even if it had shipped with an original 4GB of Ram, chances are that the PlayStation 4 would have been home to some great games. But thanks to Knack, Sony doubled up on that specific component before they launched their home console. Speaking to Inside Games (translated via DualShockers), Senior Producer Yosuke Watanabe, Outsourcing Manager Seiichiro Funayama, Game Director Takamitsu Ijima, Lead Artist Yoshiaki Yamaguchi and Lead Programmer Tsuyoshi Murakami spoke about how the development of Knack led to that bump upwards in RAM. According to the team, they were asking Sony what the console specifics would be before launch, with Sony replying that they were settling in at 4GB of RAM. The Knack team asked Sony for more hardware, Sony acquiesced and thus was born a more powerful PS4 which could handle the mind-bending physics of Knack. It’s just a shame that the game was so unfairly criticised upon release, as our resident narcoleptic and office doctor Geoff will gladly tell you how Knack was actually an old school blast from the past. 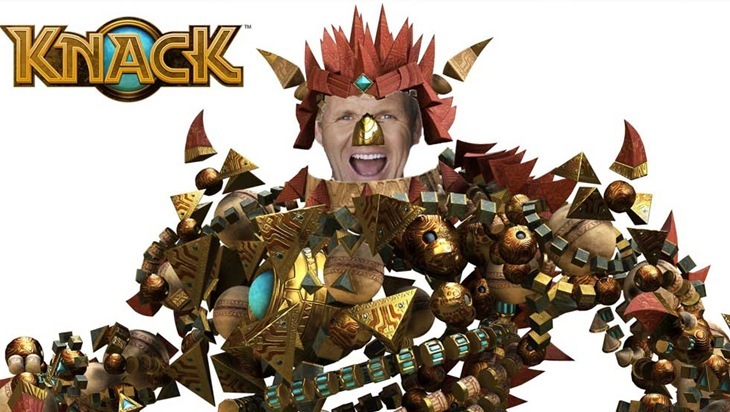 Since it launched, the game has actually begun to develop a cult following, with other reviewers and gamers praising the style and charm of Knack. It is pretty much the ZombiU of the PlayStation, a Wii U game that was unfairly derided upon release a couple of years ago.